Mountain Hiking Holidays Blog: The best beach in Bocas! 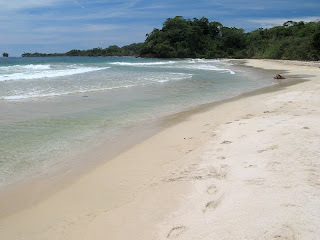 A view from Red Frog Beach on Isla Bastimentos, Bocas del Toro. We hired a local boatman to do a private transfer for us from Isla Carenero to Red Frog Beach at $20 per person. We zipped through mangrove-lined waterways to a small dock, paid a $1.00 entrance fee (you have to cross private land to access Red Frog Beach) and walked for 10 minutes through the jungle to the beach. Wow! What a beach! When we got hungry it was red beans and rice plus a cold Balboa beer at the beachside Flip Flop cafe. A spectacular day in Bocas (except we never saw the red frogs)!